A look at the effects of how an over-valuation of the exchange rate can cause deflation. Readers Question: does an appreciation in the exchange rate cause deflation? Price of imports will fall, causing a fall in cost-push inflation. Exports become less competitive, causing lower demand for exports. The rise in demand for imports and relatively lower exports will reduce domestic aggregate demand, helping to reduce demand-pull inflation. The appreciation may increase incentive for manufacturers to cut costs to try and stay competitive. If the country imports a lot of raw materials, such as oil, metals and good, then an appreciation will have a relatively significant effect on reducing inflationary pressures. It could cause deflation in exceptional circumstances. But, will an appreciation cause deflation? Deflation is quite rare in modern economies. Even heavily depressed economies often get just low inflation – inflation between 0 and 2%. It depends on other factors in the economy. For example, if the appreciation is due to rising competitiveness and a strong economy, then there is likely to be normal economic activity and strong demand, despite the appreciation. Therefore, inflation can continue with an appreciation. The impact on inflation will also depend on how much manufacturer’s pass the change in exchange rates onto consumers. After an appreciation, petrol prices may not fall as much as expected because petrol companies increase profit margins instead. Also, firms may engage in currency hedging so they smooth out currency fluctuations. However, if the over-valuation in the exchange rate is accompanied by tight fiscal policy, tight monetary policy and a global economic downturn, then the deflationary impact of an over-valued exchange rate could well translate into actual deflation. A slightly different scenario to a temporary appreciation, is if a country is experiencing an exchange rate that is fundamentally overvalued for a long time. In the Euro, these countries became uncompetitive, but there couldn’t be a devaluation because there is just one currency. To restore competitiveness, they are having to focus on reducing prices (a process known as internal devaluation). To some extent, this is causing deflation. Greece and Portugal lost so much competitiveness, that there is a need for a substantial fall in prices to restore competitiveness. The over-valuation of the exchange rate is not the only cause of deflationary bias in the Eurozone. But, it is a significant one. Therefore, being in a single currency (with no recourse to devaluation) can leave countries with significantly uncompetitive exports and an exchange rate which is unsuitable. 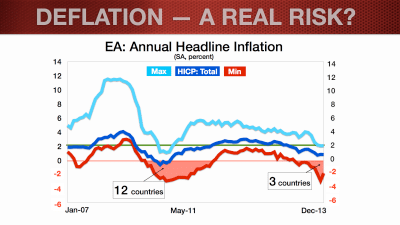 This can lead to deflationary pressures and even actual deflation, as Greece and Portugal are discovering at the moment.